Chic coats and cardis keep you warm when Mother Nature beckons you into the cold. We call them chill-chasers—hats, scarves, mitts and slippers that banish subzero temperatures. Granny-square blankets are the hippest crocheted afghans around. Kids’ knits designer Amy Bahrt shares a thing or two about creature comforts. Mother/son striped sweaters are a family affair. Looking professional doesn’t mean you have to sacrifice style. Sock knitting is the hottest trend going. We show you how to stitch a pair from cuff to heel to toe. 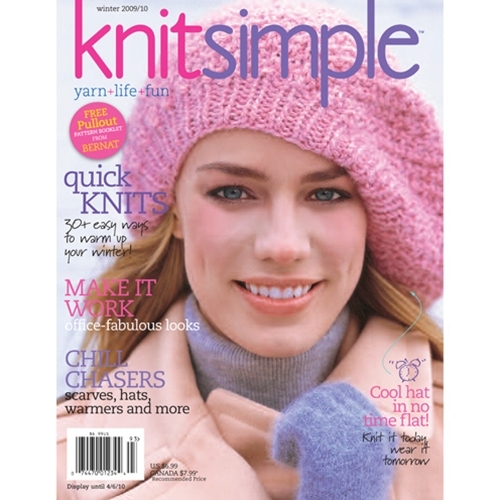 Nifty needles, hooks, markers and measures, plus knits for a cause. Get a trove of tips for Bliss-ful knitting and spend the holidays with the gals of the Friday Night Knitting Club.